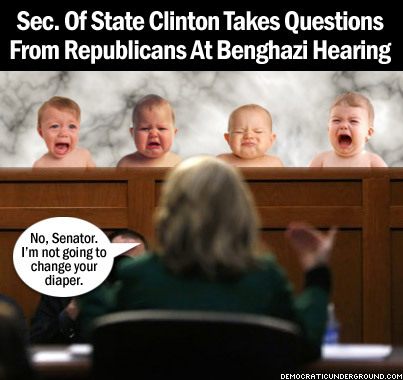 Call it the Benghazi hearing, or the Benghazi persecution. No one with half of a brain can come away from listening to those tedious hours of testimony without understanding it was all about attacking Hillary Clinton like a group of vicious toddlers. If you watched the trial hearing, like I did for 11 hours, it was as apparent as glass. Not one important piece of information was revealed from the partisan questioning – like a magician’s sudden appearance of a white rabbit leaving the viewing audience gasping with wonder. Insults flew from one side of the aisle to the other like raw meat for the press. I thought Gowdy and Cummings were going to duke it our for a moment. (Good theater there). Every Republican on the committee treated Clinton like a criminal (did you see Jim Jordan’s face?) and made little, or no attempt, at being civil. Some were outwardly hostile, rudely interrupting her answers. But as the hours withered away during this pathetic partisan onslaught – one thing became clear…Trey Gowdy and company came off looking like a bunch of delinquent children throwing erasers at the teacher! Facts are hard for Republicans to accept, especially when they have an agenda to make sure Clinton doesn’t get elected president of the United States. One thing I’m confident about, after millions of Americans have viewed this kangaroo court they going to be pissed that they paid 4.7 million dollars for nothing more a partisan persecution. The upside, of course, is this kangaroo court is going to get Clinton elected president. Mark my words. A Look at Big Feet… Not Bigfoot !